Hey lookit me I’m on BuzzFeed! But seriously though, check out this totally sweet book I wrote and illustrated and presented at the ‘96 Viola Rand Elementary School Talent Show. Dik-diks happen to be the most painfully adorable antelope ever. After I’d finished about half the drawings, I started to get bored with rote depictions of animals in their natural habitats, and my illustrations started to get a bit more … creative. Here, for example, we have an ibis who’s apparently just locked a bad guy in a cage or prison of some sort, and is also dressed to attend a birthday party. Or maybe he’s some kind of rather flamboyant wizard? I can’t recall. Yes, that spur of rock bears an unfortunate resemblance to a dong. These nyala are apparently sailing to France in the year 1731. Because, sure, why not? Can you see the ostriches? There’s one in the middle of the page, who’s just punted Scar over a waterfall with a kick of one of his mighty ostrich legs. Depicted here is some sort of epic battle, featuring ostriches, chameleons, hyenas, characters from The Lion King, and a large arsenal of missiles on both sides. Urotriorchis macrourus is the scientific name for the Long-tailed Hawk, and was the closest thing I could find to an African animal whose name started with a U.
I was unaware of that fact at the time. So, since this is an alphabet of African animals, you all knew from the beginning that the last animal was going to be “zebra” OH SNAP NO IT’S “ZEBU”!!! The zebu is a type of domestic cattle originating in South Asia that has been raised in Africa for hundreds of years. It’s pretty obscure; you probably haven’t heard of it. Oh man, I totally had you fooled! I even tricked you by decorating the “Z’s” with black and white zebra stripes. and a grey hyena who is A) apparently a good guy, or at least disguising himself as one, B) sporting a purple bandana and cape, and C) also maybe some sort of cyborg, with mechanical spider legs – and maybe that cape is actually an exhaust pipe? And God only knows what this poor bugger’s deal is. 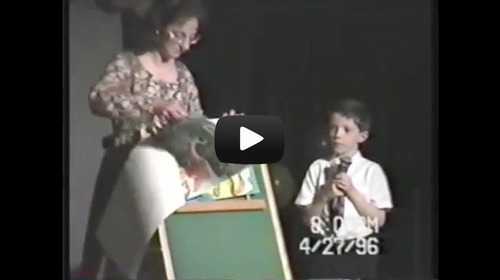 And finally, my performance at the Talent Show (with assistance from my mom).